Friending Bosses: Haven't We Learned? Must be that persons last day on the job. Well, I mean it is now regardless. Most large news broadcasters use software to help keep the written stories timed and in order. News writers, news producers, and news reporters type their scripts for their stories into the software, and the director and producers modify the stories and lineup before the newscast. All of the information for the stories is input into the newscast with this software, including the script, the names of people in camera, the timing of the story, the names of the clips to be played during the newscast, and the graphic or title information. Most of a newscast these days is automated, other than the real people you see on television. Cameras are often automated, as well, as are camera switches and graphics playback. 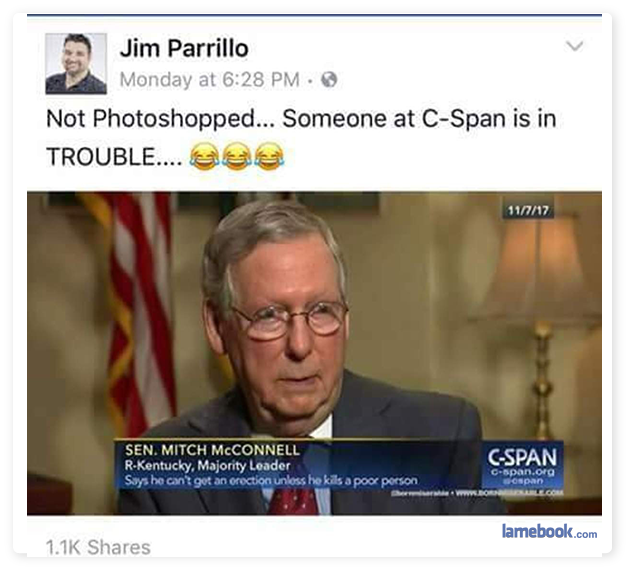 This is not the fault of a “graphics person,” because C-Span most likely doesn’t have one. This is the fault of either a writer or a producer. Either way, someone is getting fired.